I have a 60's cabin on the water in NY. 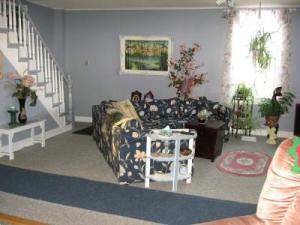 I want to update the living room which is paneled, should I white wash or paint over it? I would be interested in hearing from someone familiar with doing this or someone who is a professional. I would paint it, good luck. We had dark paneling in a family room. We painted over it. It looks great and makes the room brighter. First wash walls to get any wax [pledge] off. Prime with oil base to prevent tannin,[coffee stain appearance] i like zinzers Cover Stain , smells bad but it goes away fast. when primer is dry you can see nail holes and seams. Fill holes and caulk seams, paint 2 coats finish .If nail holes are small just use Dap #33 glazing 1/2 pint will do room put on and rub smooth. You have such a pretty room. So nicely decorated. 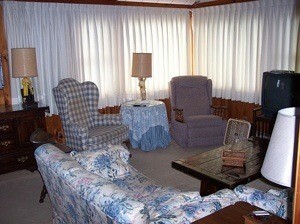 We too had a 50's style home with tacky panelling. What we did was to to cover the joint lines with painters tape and then texture paint over all. We picked the color we liked (a light olive green) and mixed stucco into the paint. The walls were brush stroked in random semi circular strokes, giving an old fashioned yet contemporary stucco'd effect. 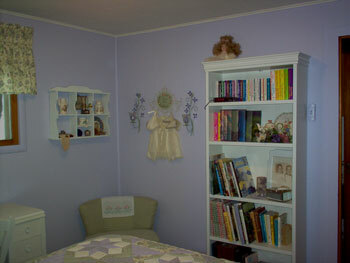 We had a lot a compliments about the textured walls when we sold our house a few years later. The nice thing about this is that any and all imperfections in the wall (eg. joint lines or cracks) are covered and because the stucco is mixed into the paint, it doesn't flake and the color can be changed whenever you want. It sure beat the heck out of tearing down old panelling, putting up new drywall, etc. and spending a bundle of money. 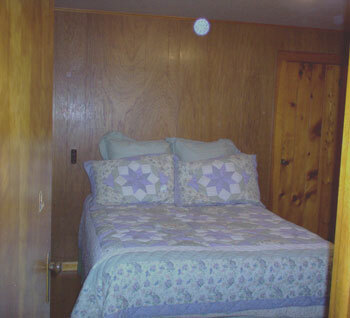 I live in a house that was built in 1957, apparently when tacky wood paneling was in style; and after fifty years it has only gotten uglier! I can't afford to remove the paneling and drywall, so for a quick fix of color I decided to prime and paint. 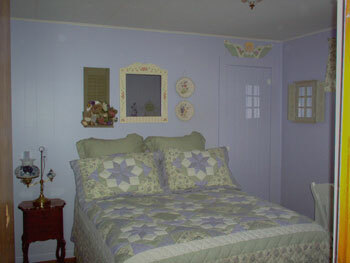 I used the comforter to pick out colors for the color scheme. I bought Ace brand paint and primer. I have used other types of primer on the paneling in other rooms and found that it ran down the wall. The Ace brand is very thick and did not run at all and spatters very little when rolling. Hey Paula! Your bedroom looks beautiful. I have seen paneling being painted on the home improvement shows. It is much faster and cheaper than trying to take it down and repairing the wall. Hi: I did the same thing in my living room, now its also my favorite room. I stressed myself out for 15 years about the ugly paneling and like you, I am so pleased now. Beautiful, Judy, just beautiful. You are a great inspiration to me; my living room will be the next room to tackle!